As we enter the last 1,000 days of the Millennium Development Goals we need to make every dollar we spend go further. But we cannot continue to conduct business as usual. The Brookings Institute estimates that the volatility of development aid costs as much as 28 cents of every dollar spent -impeding our ability to deliver results for those in need. Instead, we must work better, faster and smarter. By using new and groundbreaking tools that can improve the efficiency and predictability of donor financing, we can ensure that life-saving goods arrive in time to save lives. Pledge Guarantee for Health (PGH) is one such simple, yet innovative tool that can help speed the delivery of critical health commodities by 6-8 months. PGH provides countries with working capital to help smooth over any delays in donor aid disbursements, giving them time to plan their procurements. Better planning enables countries to get more value for money by negotiating better prices with suppliers and reducing the cost of shipments. Most importantly, countries are able to accelerate delivery of, and access to, necessary health commodities. PGH already has a proven track record for delivering results: in Zambia, PGH worked with the World Bank to facilitate an innovative financing solution that helped accelerate the delivery of bednets before the start of the rainy season. The end result: the bednets arrived on time averting an epidemic AND due to incentives built into the partnership, the World Bank worked with the Government of Zambia to ultimately provide one of their fastest disbursements ever. USAID, in partnership with Swedish SIDA, is proud to help support and scale up PGH by providing a $50 million credit guarantee using USAID’s Development Credit Authority (DCA). This co- guarantee will allow PGH to access up to $100 million of credit from commercial banks. This $100 million of credit can “revolve” up to 10 times, meaning it has the potential to generate up to $1 billion of transaction over the five year guarantee period. USAID’s participation in this effort is through a partnership between the Development Credit Authority (DCA) and the Bureau for Global Health’s Center for Accelerating Innovation and Impact (CII). DCA has successfully used similar risk-sharing mechanisms in 72 countries around the world, and has unlocked $2.7 billion in credit for developmentally-important projects and businesses. CII uses business-minded approaches to address key bottlenecks in the development, introduction, and scale up of global health technologies and interventions. USAID’s support of this initiative reflects the Agency’s effort to utilize innovative financing mechanisms to leverage private capital to stretch limited aid dollars further. We are committed to working with our partners in the international development, financing, and supplier communities to ensure that we maximize the value of every dollar spent, ending preventable maternal and child deaths and changing the face of poverty forever. USAID ought to consider reaching out to the global ‘Open Source’ Health Information Technology (HIT) community and help countries discover and use the many high quality, free and open source health IT solutions now available, e.g. OpenEMR, OpenMRS, VistA, etc. These are already being used in tens of thousands of locations in helping to care for hundreds of millions of patients. 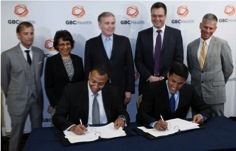 See http://www.openhealthnews.com for more information, links to resources, etc.